Sometimes I have great trouble getting foundation make-up to stay on. By lunchtime the efforts from that morning are all gone. There is an array of products out there but which one to choose? You can use an antiperspirant for your face under you make-up especially on hot or humid days. Neat Feet Face and NoSweat For Face are both products that work well particularly for those who perspire a lot. They both contain aluminium as most antiperspirants do but there is still debate about the effects of aluminium use. Pre-foundation Primers allow makeup to go on smoother for more even application and lasts longer. They smooth & soften lines and appearance of pores. The other benefit is that it keeps foundation colour “true”. Primers are a great pick-me-up for those times when you have been burning the candle at both ends and it is starting to show. Most are used over your moisturiser and applied before foundation make-up in the same way you would apply your moisturiser. The wonderful thing is you can get colour correcting primers for sallow skin tones or for neutralizing redness. Many of the hydrating or lubricating primers are based on soybean extract or silicone. Powder applied over foundation make-up gives a flawless appearance and also controls oil or shine. The question now is loose or pressed? Loose powder is more lightweight and gives a more natural appearance. 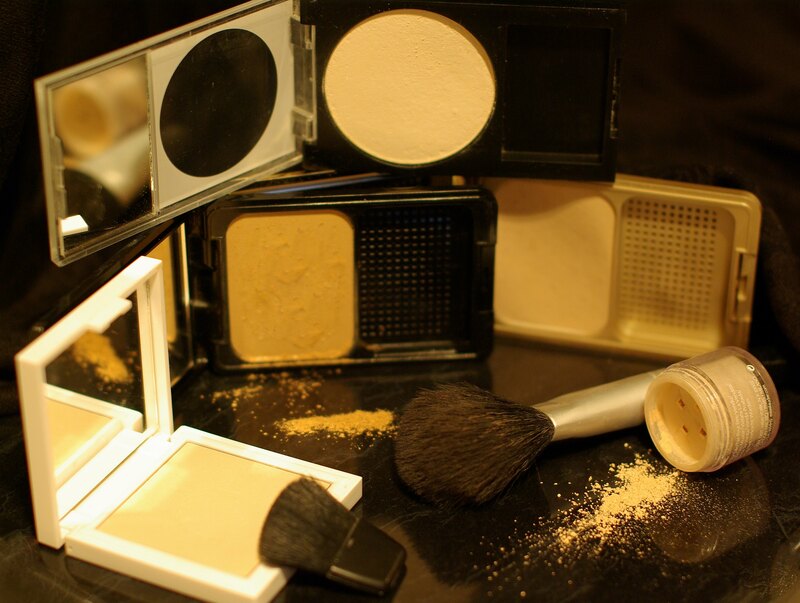 Pressed powder gives a more flawless look and can be “built” upon (by applying in layers) for a heavier coverage. Applying powders over the lips can help to also set your lipstick and stop bleeding. I have found the easiest technique for applying loose powder is with a big fluffy powder brush after your foundation. Dip it into your powder or shake it out onto the brush and apply in a downward motion over the face. Another great way but slightly messy in your bathroom is the powder rubdown technique. Apply after make-up, pour loose powder into your hand, and rub your palms together like a gymnast, then “wash” your face with powder from your hairline to your chin. Keep your eyes closed so you don’t get powder in them. Simply brush off any excess with your powder brush. Pressed Powder comes with a sponge for ease of application. Simply apply in light downward strokes over the face. Avoid the eye area. If you want a heavier coverage keep applying or “building” layers until you are happy with your look. On special occasions or days when I am feeling hagged I use both primer, to smooth those life lines, and pressed powder, for a flawless look. I avoid using powder on my forehead and anywhere near my eyes so those life lines are less distinct.